Chancellor Gary S. May of the University of California, Davis, has selected Renetta Garrison Tull to serve as vice chancellor for diversity, equity and inclusion, a new position May announced last March to “engage more effectively with the recruitment and retention of the best and brightest students, faculty and staff.” Tull is a passionate advocate, global mentor, education policy strategist, and champion for equity in science, technology, engineering and mathematics (STEM). Tull is associate vice provost for strategic initiatives at the University of Maryland, Baltimore County (UMBC), as well as director of graduate and professional pipeline development and special assistant to the senior vice chancellor for the University System of Maryland (USM). She is co-director and co-principal investigator of the USM’s Louis Stokes Alliance for Minority Participation (LSAMP), which covers three universities and two affiliate campuses and aims to increase the number of STEM bachelor’s and graduate degrees earned by students from historically underrepresented groups. The new Office of Diversity, Equity and Inclusion, which Tull will lead, will comprise four units: Campus Community Relations; Office of Academic Diversity; Office of Diversity and Inclusion, Davis Campus; and UC Davis Health’s Office for Equity, Diversity and Inclusion. In addition to directing the LSAMP program at UMBC, Tull is co-principal investigator and founding director for the National Science Foundation’s PROMISE: Maryland’s Alliance for Graduate Education and Professoriate (AGEP) for 12 institutions in the state university system. She has led workshops for students from across the United States and Latin America to prepare them for graduate school. A few sponsors of those workshops include AGEP, National GEM Consortium, National Society of Black Engineers, Society for Hispanic Professional Engineers, Society for the Advancement of Chicanos/Hispanics and Native Americans in Science, American Indian Science and Engineering Society, and the Alliance/Merck Ciencia Hispanic Scholars Program. Tull is Professor of the Practice in UMBC’s College of Engineering and Information Technology, where she focuses on humanitarian engineering. She has also served as adjunct faculty in the Department of Hearing and Speech Sciences at the University of Maryland, College Park. She is vice president of initiatives for the Latin and Caribbean Consortium for Engineering Institutions, and she has been a speaker at the United Nations, as a guest of the UN Educational, Scientific and Cultural Organization for side events of the Commission on the Status of Women. Her work in diversity has been recognized by the Global Engineering Deans Council and the accreditation board for engineering and technology. “Renetta is a perfect fit for UC Davis,” said Kevin R. Johnson, dean of the UC Davis School of Law, who served as the chair of the recruitment advisory committee. “She has an impressive record of diversity, equity and inclusion advocacy and support for diverse and excellent students from coast to coast and beyond through an array of national initiatives and efforts. Tull has written more than 50 publications, given more than 200 presentations on various STEM topics, and is a Tau Beta Pi Eminent Engineer. She also engages the public on topics related to STEM and society, and was a speaker for “Diversity, STEAM and Comics,” where “A” adds the arts to STEM, at Awesome Con last March. She is a member of the National Association of Diversity Officers in Higher Education, and served on the board of advisors for the Pacific Northwest Circle of Success: Mentoring Opportunities in STEM (PNW-COSMOS, an alliance for graduate education and the professoriate) to increase the number of American Indian/Alaska Native students who complete STEM graduate programs. She has served on boards that develop policies for faculty diversity, and is a committee member for the Science of Effective Mentoring in Science, Technology, Engineering, Medicine and Mathematics for the National Academies of Sciences, Engineering and Medicine. Tull earned a bachelor’s degree in electrical engineering from Howard University, and, then, at Northwestern University, a master’s in electrical engineering (focused on speech signal processing) and doctorate in speech science. She was an Anna Julia Cooper postdoctoral fellow, researching vocal physiology, at the University of Wisconsin-Madison. A passion for communicating to diverse audiences is demonstrated by Tull’s long list of speaking engagements, blog, interviews. awards and recognition. Her husband of more than 25 years, Damon L. Tull, shares her commitment to equity and access. She is active on Twitter with the handle: @Renetta_Tull #ThinkBigDiversity. 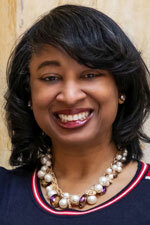 Tull will begin as vice chancellor of Diversity, Equity and Inclusion on July 1.